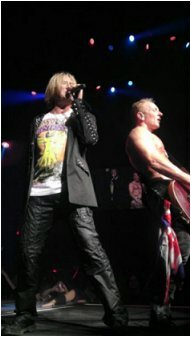 Def Leppard played the 10th show of the 2013 VIVA Hysteria! residency last night at The Joint in Las Vegas, NV with 22 songs played. Night ten saw the band play another 8 song opening set as "Ded Flatbird". The order of songs was changed once more with the superb opening of 'Good Morning Freedom' and 'Rock Brigade'. In an unexpected change the band added in 'Rock On' for the first time at the residency. 7 albums were covered in the first set plus the B-Side of 'GMF'. The full 'Hysteria' album followed with the usual encore of 'Rock Of Ages' and 'Photograph'. A Live Blog direct from the show happened on this site with much help from various fans who were in attendance. The 11th and final show takes place tonight. Live Blog?.